I have made this very simple so the average Joe can understand what the industry is offering and all of the FTP LT techies can nitpick it apart and tell you what I am missing. Also make sure your calculator is in degrees and not radians! 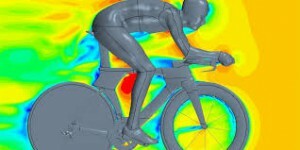 Each aero test on the market you see how the wheels, bike, helmet compare in 0-20 degrees yaw, but what does this mean to me? The angle of yaw is simply the amount of crosswind on your bike. Below is a simple graphic to help calculate the yaw angle that you see when you ride. Now we must calculate the F_relative. This incorporates the wind speed and velocity of the cyclist. Since the wind speed is relative to the cyclist there is no angle on the cyclist. 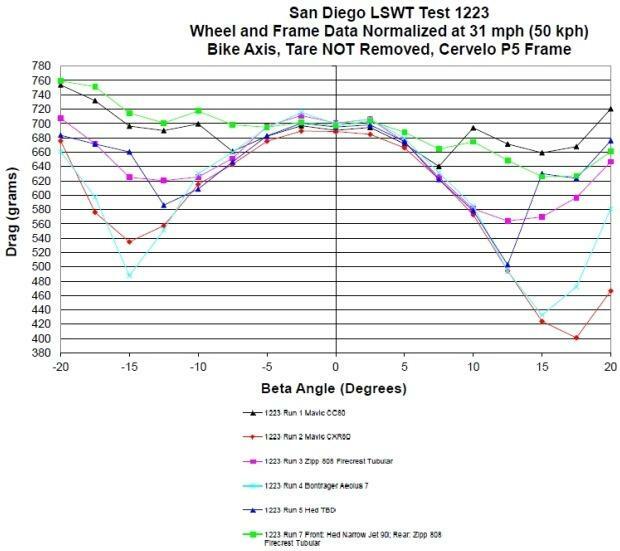 At this point we can relatively easily calculate yaw angle since the yaw angle is simply the relative Velocity of crosswind to the cyclist. What you will quickly notice is that the ratios that the industry uses are quite small. For a rider going 25 mph below is a chart of what the cross winds would need to be to have a 5, 10, 15, 20 degree yaw. Yes these values are quite small but you need to keep in mind that this is straight crosswind speed. Since this is all just geometry we can plug in velocities instead of forces. If the wind was at 45 degrees cross head wind and you wanted to have 20 degree yaw angle we would be talking 20 mph wind. Now here is where it gets crazier…if you turn around and now the wind is a cross tail wind of 20 mph at 45 degrees you would now have a yaw angle of more than 45 degrees. Why? Your relative velocity (V_relative) is only 10 mph and your V_cross is still 14 mph…in a cross tail wind a 20 degree yaw angle is a mere 9.5 mph at 25 mph! This is simple, a straight head wind, small differences between bikes and wheels. For those of you that live along a coast or in the midwest this is the important data points. What I do is just look and see what the aero data is doing in this area because this is the closest conditions to which we race. If you look at the curves it actually looks like drag decreases with yaw. The aero drag decreases but other forces, angles, and body position changes causing increases in other areas…Or I’d be riding my bike sideways! What is YAW? Over 80% of your training and racing is out of the design and test range…hmm that is comforting! Actually, this is basically entirely wrong. For a number of reasons. The first is that what you actually need to know is the wind speed at the height of a bike, which of course varies. At the actual ground, it’s 0 (always). And then it varies along the boundary layer up until you get into the free stream. But, for example, a 9.5mph wind at approx. 0.5m – 1.0m (bicycle height) would be INSANE. That’d be the equivalent of like a 30mph crosswind as reported by the weather station, which measures way up in the free stream. You can buy a simple handheld anemometer (wind meter) if you want to test this yourself. Furthermore, when you think about your tailwind conditions, you are making totally unreasonable assumptions in that you clearly don’t account for the effect that tailwind has on forward speed. It’s a tailwind for a reason. In other words, yes, you can get super high yaw with a 9.5mph cross tail if you were riding at 25mph, but – remember what I wrote about reported wind speeds – that’s because you’re claiming the rider is going to be going 25mph with a 30mph(ish) tailwind (as measured in the free stream). If you have a kicking tailwind, it ALSO propels you, which pretty much shoots your entire argument about experiencing very high yaws totally full of holes, because now your F_bicycle (which really should be V, by the way, since we are talking about velocities, not forces). The easiest way (I think anyway) to think about it is to break V_wind into it’s two components – drag/propulsion (along the axis of the bike) and then “lift” (basically the force that is perpendicular to the bike). You can calculate V_bicycle_relative (which accounts for the contribution of wind along the axis the bike travels) and then take the arcTANGENT of that & the “lift” component of the wind to get your yaw angle. That’s a much simpler way (IMO) of doing this math, that also exposes pretty clearly the flaws in your logic (using the term very loosely) about tailwinds causing ridiculously large yaws at low velocities. My general advice – don’t try to do heavy thinking when training for an Ironman. Speaking from experience. Both past and current. 9.5 mph wind is actually a lot, very rare at ground level. If the weather channel says 10mph then ground speed is typically 1/2 to 1/3 of that. If there was a 10mph cross tail wind you (and even I) would be going a lot faster than 25mph. 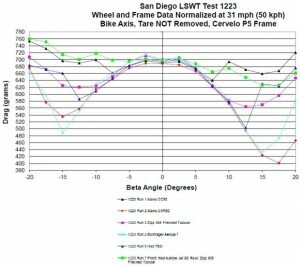 Various people have put on-board wind meters on bikes and measured actual yaw angles, one example here: http://engineerstalk.mavic.com/why-weightings-should-be-applied-to-wheel-drag-data-to-measure-aerodynamic-performance/ Also http://alphamantis.com/ can provide you with the hardware to test this for yourself if you wanted. Starky, you lost me at arcTANGENT, but I get what you’re trying to convey, the lab setting (wind tunnel) doesn’t always translate to real world. I think I need to forget buying those Zipps from Keith and get me some Mavic CRX 80’s! Andrew, we’d be happy to help in any way. Please contact me, if you’re interested.